Tonight on FOX, SO YOU THINK YOU CAN DANCE continues with a new episode. On tonight’s the second round of auditions continues and features hopefuls in Chicago and Los Angeles. Guest judges include Jenna Elfman and Fabrice Calmels (Chicago); and Christina Applegate (Los Angeles). On the last episode of SO YOU THINK YOU CAN DANCE, the 11th season premiered with SYTYCD auditions in New Orleans. Each contestant got a shot in front of the judges: Mary, Nigel, and guest judge Wayne Brady. The most memorable perormance was Jacoby who challenged Wayne Brady to join him on stage and taught him a few dance moves; unfortunately the judges didn’t think he was a good fit for So You Think You Can Dance. Did you watch last week’s episode? If you missed it we have a full and detailed recap, right here for you. On tonight’s show the competition continues tonight when SO YOU THINK YOU CAN DANCE heads to Chicago and Los Angeles. Watch what happens when the most gifted dancers – skilled in a variety of dance styles, including jazz and krumping – all compete for a prized spot on the live shows in Los Angeles. A new episode of So You Think You Can Dance Season 11 airs tonight at 8PM and you don’t want to miss it. Celeb Dirty Laundry will be live blogging the show each week, so don’t forget to come back to this spot at 8PM EST for our live recap! 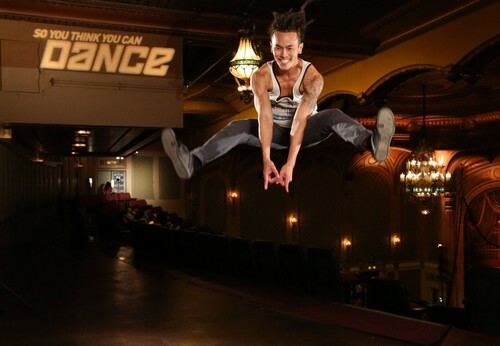 Tonight’s episode of So You Think You Can Dance kicks off with auditions in Chicago. SYTYCD judges Mary, Nigel, and Fabrice Calmels take their seats and prepare to judge the dancers auditioning. The first dancer’s name is Paul Brushaber, AKA “The Puppet.” Paul explains that he “dances like a puppet.” After his performance Mary says, “I really wanna live in your world. We are always asking for something unique and you have brought it. You free styled that, but you would have thought you worked on that for years. Sensational!” Mary wants to send him straight through, but Nigel is hesitant because Paul has never danced with a partner before. Quest judge Fabrice argues that Mary has a point, so Nigel agrees to put him through to the next round of auditions. Up next is dancer Emily James, she has already auditioned during Season 8 and Season 9. Although she has a marketing degree, she knows deep down she is supposed to be a dancer. Emily takes the stage and performs a contemporary piece for the judges. Mary says, “Listen to your gut and listen to your heart. You are doing the right thing. You are a dancer.” Fabrice says that her performance “was really solid. I really really enjoyed it.” The judges are unanimous, and they put her through to the next round. Franchesca takes the SYTYCD stage next and performs a contemporary piece for the judges. The judges are smitten with her, Nigel announces that he “was mesmerized with her.” Mary dubs Franchesca as “absolutely captivating and unique.” Fabrice agrees that she was unique, and adds that “her connections were fast and controlled.” The judges all agree to put her through to the next round. Jenna Scaccia auditions next and performs a ballet piece for the SYTYCD judges. Mary and Nigel agree that Jenna is a beautiful dancer, and Mary says she looked like she was “floating on a cloud.” Fabrice reveals that he loved it as well, and the judges give Jenna a ticket to the next round. James Thomas is a hip-hop dancer, and he specializes in contortionism and “bopping” (a Chicago style dancer). Nigel jokes that he would prefer puppetry. Mary thinks that everything he did was interesting, but scary too. Fabrice agrees that James’s audition was insane. They send him on to choreography, however he thought the dance was too hard to pick up so he decided to drop out of the competition. 20 year old Valerie Rockey auditions for the SYTYCD judges yet, and performs a tap number. Nigel appreciated her performance because tap dancing is a dying art. Mary agrees that Valeria “is full of life and light.” Christina confesses that she tried to stare at her feet to make sure she was hitting all the beats, but she kept being drawn up to her “beautiful face.” The judges agree she should go on to the choreography round. Jaja Jankova, hailing from the Czech Republic, takes the SYTYCD stage next and performs a beat-boxing dance for the judges. Christina, Nigel, and Mary give her a standing ovation when she is finished and the crowd goes wild, the judges give her a ticket to the next round of tryouts. Kansas native Kyle Taylor takes the stage next and performs a pop routine for the judges. He confesses that he has never trained with a professional or danced anywhere other than his living-room. Afterwards Nigel says that he looks like he should be battling other dancers. Nigel has some SYTYCD alums come up on stage and have a dance battle with Kyle, including Cyrus, Fik-Shun, and Legacy. Afterwards the judges decide to put him through to the choreography round. The next dancer to audition for the judges is 19 year old Justine Lutz, with a contemporary piece. The judges give Justine a standing ovation, and immediately hand over her ticket to the next round of SYTYCD. A due takes the stage next, Deise Mendonca and Mauricio Vera. After their performance Christina Applegate is in tears, she says “you can feel the love between you too and it’s just beautiful. I love you both and I want to watch you dance all day long.” Mary says that “your presence is so dominating and exquisite.” Nigel announces that they are both getting tickets and moving on to the next round. Justin Bieber makes another appearance on So You Think You Can Dance tonight and asks America to vote between two dance crews, the winner will have a chance to perform live on the So You Think You Can Dance finale. The first team is “Break Skate,” a team of all men who break dance on roller skates. The next crew America can vote for tonight is called Academy of Villains, and they refer to themselves as “illusional dancers” with a mix of theatrics. Back at SYTYCD auditions, Kailee Payne takes the stages to perform a “jazz funk” dance for the judges. Christina, Nigel, and Mary all agree that they loved her performance. Kailee Payne is going on to the next round of tryouts. Sebastian Serra auditioned for Season 10 of SYTYCD, and unfortunately didn’t make the cut, so he is back again to try to wow the judges. Mary comments that his “elevation is amazing and she felt like they needed more stage before he busts out.” Mary tells him to come down and get his ticket to the next round. 18 year old Dani Platz auditions for Mary, Nigel, and Christina next. She has been dancing since she was three years old, but she took two years off in high-school because she was struggling with an eating disorder. Nigel says, “there were parts of your body going in places I have never seen before. As a dancer you are quite beautiful and you felt that music.” Christina says, “you’re broken, and there was so much acceptance of the fact that you’re broken. But, I got exactly why you did that with your arm. But, you’re healing, and by telling your story you are helping other girls heal.” Mary and Nigel send her through to choreography, despite the fact that Christina wants to just give her a ticket right now. The final dancer to audition tonight is a street dancer who calls herself Mary “Poppins” Bonnevay. Nigel says she is “absolutely sensational and unique and so elegant as well.” Mary says she is “the epitome of a true artist and every single move she made was genius.” Christina agrees that she loved her performance, and Nigel tells her to come down and get her ticket. It’s time for the choreography round where fourteen dancers were sent for another look to see if they make the cut, one dancer bows out and another vomits on the stage, and in the end they decided to keep tap-dancing Valerie and Dany Platz.